Hard Synths, deep subbasses, space atmospheres and fast breakbeats combined in a powerful and melancholic mood. Welcome to the dark side of Drum & Bass. Neurofunk incudes four construction kits with 566 MB and 250 files. To guarantee the most flexible use, each kit has a main part and a variation, intro, outro as well as rise and break parts. The tempo variies between 170 and 176 BPM. 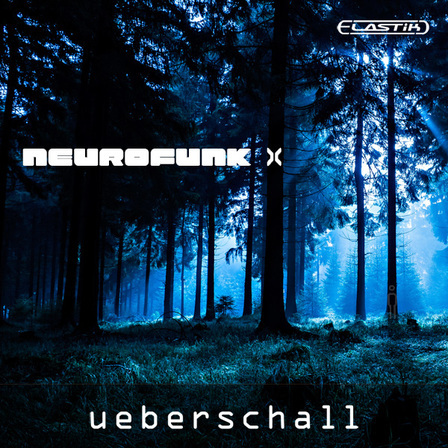 Ueberschall presents Neurofunk. Hard Synths, deep subbasses, space atmospheres and fast breakbeats combined in a powerful and melancholic mood. Welcome to the dark side of Drum & Bass. As usual with Ueberschall the drums are available as a complete mix and in single tracks. Bassdrum, snaredrum, hihat, cymbal and drum fx tracks can be combined conveniently to create new groove-variations. Furthermore the mixed drum version can be integrated in your project right away or you can us the included single drum sounds to create your own drum patterns. Besides neurofunk this library is perfect for producing ascending genres like techno, dubstep or any kind of breakbeats. No matter if you are in music production, filmscoring or jingle creation - Neurofunk will make it possible. Ueberschall‘s Elastik Player is the best available tool for loop-based music production. With just a few mouse clicks the loops of Neurofunk can be matched to any track in pitch and tempo. All installed Elastik libraries share a common clearly arranged browser, granting immediate access to all installed loops. Here, you may not only exchange and combine loops of a single- but of all installed Elastik libraries – a huge pool for remixing.